An example of a Mind Map wilderness. Mind maps are diagrams used to represent words, ideas, tasks, or other items linked to and arranged around a central key word or idea. When using a mind map to design a wilderness, the various locations are arranged as separate ideas and connections are drawn between these locations to represent physical pathways. Designing a wilderness as a mind map is an organizational technique for game masters. It is used to design wilderness adventures with substance and make it easy to manage that substance at the game table. Players benefit by having a well-written adventure, but this post is primarily for game masters. 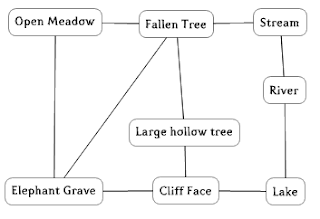 Mind maps can be thought of as being similar to a dungeon; each room of the dungeon is an idea, and doors are the lines which connect two ideas together. We will use this terminology when describing the wilderness mind map. A scene in a forest may be one of a waterfall falling into a deep stone basin of green water, but we will call it a room. A small pathway carved into the side of a mountain will be called a door. The party’s motivation needs to be considered before beginning a mind map wilderness. The hook or hooks for enticing your players toward adventure should influence the design of your dungeon. If nothing comes to mind at the start, hooks can develop during the design process. Move forward in the process and be prepared write down any ideas for hooks that come along. Game masters will need something to write with and several pieces of paper to design their wilderness adventure. The three main elements to your mind map wilderness are rooms, doors, and in-betweens. Rooms represent the major scenes in your adventure. All the encounters and challenges are organized into rooms. A room in a wilderness mind map is depicted as a bubble. Players enter and exit scenes in your adventure by following paths in and out of these rooms. The first step in drawing a mind map wilderness is drawing a bubble to represent the first room. If the bubble is too small to write a few sentences in, key that location to another sheet of paper. Each room needs a short description to be read as the party encounters it. A room’s description should be enough to give the players a clear image of the area and to set the area apart from any others they may encounter. The description should be short and simple. Trees here cast a lot of shade, and it’s comfortably cool. The grass is tall, dry, sharp, pulls at the hems of your cloaks and scuffs the leather of your boots. A creek overgrown with weeds is small enough to step over and flows from the east to the west. The example above uses the creek as a door by encouraging the party to follow it up or downstream. Game masters cannot take for granted that the party will decide to follow the stream, but he can discourage the party from moving in certain directions by describing hazardous terrain. Trees here cast a heavy shade, and it’s comfortably cool. The grass is tall, dry, sharp, pulls at the hems of your cloaks and scuffs the leather of your boots. A creek overgrown with weeds is small enough to step over and flows from the east to the west. A copse of thorn bushes to the north is wide and dense. Moving in that direction will be difficult. The copse of thorn bushes is an obstacle the party would avoid if they are able. The party could still walk around or through the obstacle, but they have given a reason to avoid that direction. Ultimately, the players should decide if they are going to avoid a hazard. Some terrains are relatively safe, and others are practically impassible. A copse of thorn bushes should be a moderate hazard to the party. It should be unpleasant for those unused to the trials of the wild and those who do not have abilities like woodland stride, but a concerted effort to pass should yield results. A sheer cliff face is practically impassible for everyone without significant climbing experience. It should represent a significant danger to those who seek to scale it. Game masters should not completely disallow the party from attempting pass a hazard beyond their ability, but they should make the dangers apparent. For organization, encounters occur exclusively in rooms. They should be prepared ahead of time and be of an appropriate challenge level. Combat encounters should make use of the varied terrain in the wilderness. Fallen logs, shallow pools of mud, thick bushes and large boulders are appropriate for encounters in a forest. Loose gravel, sharp rocks, and dangerous fauna are compelling features of an encounter set in the desert. Doors are transitional scenes between rooms. Doors are represented on the mind map by lines drawn between rooms corresponding to directions the party may travel. A deer path, a creek, a river, or a copse of bushes could be a door. Each door has some descriptive text as segue to the next room. The description should be brief, mentioning the approximate time traveled and the general terrain, and not go into details about landmarks. If the door’s description is too long or too interesting it would work better as a room. The remarkable events of the party’s journeys are handled primarily in rooms. The game master needs to usher the party through the door quickly and introduce the next room before the party gets distracted. Doors need to represent enough distance to contain an in-between and obscure the exact dimensions of the mind map wilderness. The time it takes the party to travel from one room to another needs to be long enough to contain an in-between and obscure the exact dimensions of the mind map wilderness. An hour per door (roughly 4 miles) makes for a very large wilderness, while 10-minutes per door (less than a mile) will make a relatively small wilderness. Doors in a wilderness dungeon differ from doors in an actual dungeon in that the party cannot peek into the room or listen at the door before deciding to enter. By the point that the party can see what is in a room they have already passed through the door and have effectively entered the room. When the party moves through a door, they contend with the environment and risk becoming lost. The scout leading the party may use his Survival skill to avoid becoming lost. One character may make a survival skill check each time the party moves through a door. The base DC for this skill check is 15, but the DC can be influenced by the terrain and environment. Success means that the scout has shown the party the right direction, and they arrive in the next room without significant delay. If the survival check fails by four or less the group takes twice as long to get to their destination, in addition they must make constitution checks with a DC equal to the failed survival check to avoid becoming fatigued by the terrain. Characters that are already fatigued instead become exhausted. A survival check that fails by five or more means that the group becomes so lost they double back to a room they’ve already been. A dungeon has walls, but the wild has hazards. In the wilderness, the party has more freedom and can move in any direction they like, but they must make their own trail. The game master encourages the party to go in certain directions with hooks and obstacles, but it is only a matter of time before the party goes a place he has not detailed. Role-playing games are improvisational, but game masters can have a plan by creating several modular rooms in advance. These rooms are called “in-betweens” because they can be sewn between two rooms as they are needed. In-betweens are easy to place, but they take just as much time and effort to design as any other room. Encounters with monsters or hostile animals can encourage the players to stay on the beaten path, but every encounter in an in-between does not need to be a random encounter. An in-between containing a cave can be placed in reserve so that game master is able to place it when the party is in need of a secure place to rest and recover. If the players are losing interest in exploring the wilderness, the game master can place an in-between containing a fight to renew the player’s interest. In-betweens containing undiscovered ruins or natural wonders can create a sense of discovery. An in-between is placed by drawing a line from the room that the players are leaving and a room that the players will ultimately enter, and label the line as a specific in-between. Game masters can also label a door that already exist as an in-between so that they can place modular elements to the map as they are needed. Once the game master has placed an in-between he can begin describing the room as though it were there all along. When the party returns to an in-between it behaves as any other room. The party may want to deviate from a pathway or an in-between before arriving at a room. Game masters can place in-betweens the same way as placing an in-between from any other room. A line is drawn and connected to the nearest room and labeled as an in-between. A game master has the discretion as to whether or not to place an in-between. If the party deviates from prepared paths and it seems too early or an inappropriate to inject a mind map, an ad-hoc door can be drawn between the room that the party is leaving and an adjacent room. This ad-hoc door behaves like any other door; he gives a brief description of the transition and quickly introduces the next room. The party often backtracks to places they’ve already been, and they should find those locations in the same place they left them. Landmarks which can be seen from anywhere in the dungeon, like mountains towering in the distance, should always be in one direction. These landmarks can be used as a point of reference when navigating the wild. A mind map wilderness is not a fully illustrated map with each distance and each rock placed in proper order, but the general dimensions of the forest can be detailed with the mind map. The exact barring of a room on the mind map does not directly correspond to the barring of the location it relates to on a map, but a compass rose can be used on a mind map to indicate what directions the rooms are relative to one another. For example, if the compass rose indicates that north is toward the header of the page, a room closer to the top of the mind map is farther north than those beneath it. A room to the right of same mind map is more eastern than a room to the left. This is an abstraction, however. A room drawn on the mind map two inches farther left and a little higher than the party’s location is not necessarily several miles west and a few degrees north. An in-game or prop map with exact coordinates will be an obstacle to a game master managing a mind map wilderness. Grid wilderness is discussed in the next chapter, and works very well with detailed maps. If the party has a map at their disposal it should provide a circumstance bonus on survival checks to avoid getting lost, but even with a map navigating the wilderness is a matter of overcoming obstacles and circumnavigating the many impassible terrains.